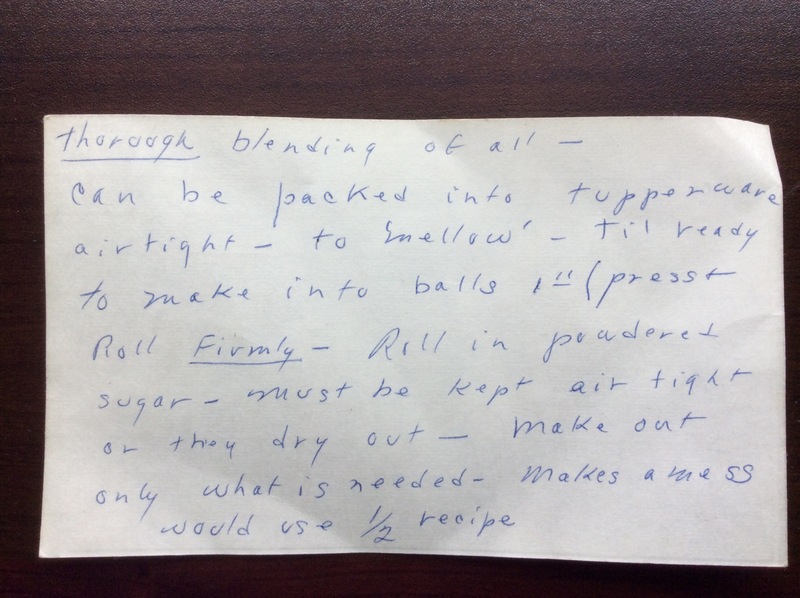 This is one of several recipe cards Mom wrote up to pass along the secret of her famous Rum Balls, which she developed with her best friend, Veda West. .The story of how this recipe was created involved a big church fundraiser, endless taste-testing, taking doors off hinges, and getting plastered. Also the way I heard it, Mom and Veda had to explain to the church pastor why they were so shickered making Christmas cookies in the church kitchen. My niece Raeanne has the Christmas card they sent back and forth multiple times in later years, with a story about a cheerful bunny making a batch of liquored-up fruit cake, with disastrous (and hilarious) results. This made them laugh like stink each year; Christmas had well and truly begun when the card had been sent back and forth. Use 1/2 recipe for less than a mob! Be sure wafers are crushed well, no lumps, and nuts are finely chopped. Sift powdered sugar and cocoa together. Blend rum and Karo. Add sugar and cocoa to (vanilla wafer) crumbs, then add in the rum and Karo, thorough blending of all. Can be packed into Tupperware airtight (containers) – to ‘mellow’ – til ready to make into balls 1″ (press and roll firmly). Rolls in powdered sugar – must be kept air tight or they dry out — make out only what is needed – makes a mess. Would use 1/2 recipe. That’s pretty much the verbatim transcription. Mom seemed to use a dash or emdash for any kind of punctuation. The card is in a little plastic envelope and is a bit messy, with guck on it from being handled with gooey hands. The older versions of this recipe are with my sister Timmy – she says she has several cards, but still had to adjust the recipe a bit for a reasonably-sized batch. My niece Holly Martin, who’s one of the family foodies, commented on Facebook that this didn’t seem to have enough rum! Well, well see, but I seem to recall these things being pretty powerful, so don’t give them to anyone that should not have alcohol, as they are not cooked in any way. David remembers helping Mom to roll out a batch on his first visit to Salt Lake to meet the family, which was in about 1996? Before we were married. 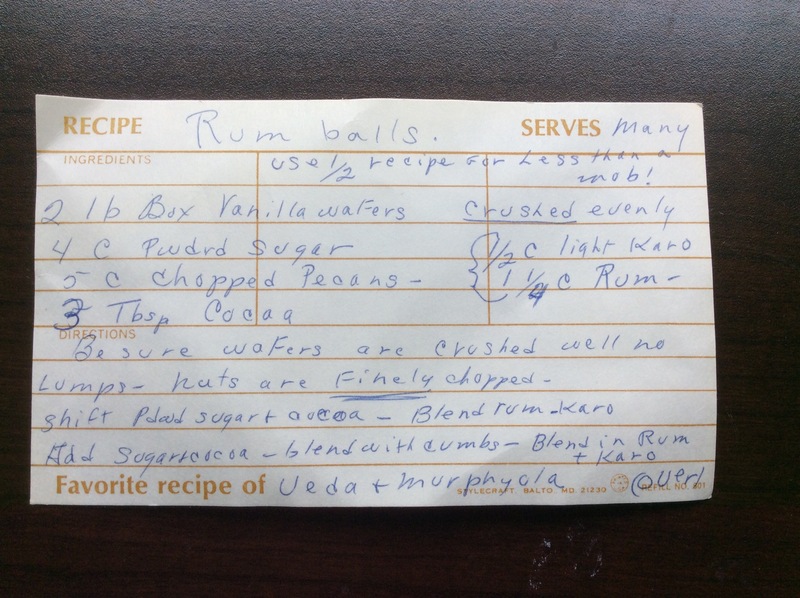 I’ll be attempting to make rum balls this year – I have a smallish food processor so I’ll be making either a quarter batch or a half batch. I bought Hershey’s Special Dark cocoa, I have Captain Morgans’s Spiced Rum, and a 12 oz. box of Vanilla wafers, so will probably add in some crushed butter cookies to make up the difference. Will have to run out to the store for the additional cookies though, cause I ated the first box this week for teatime snacks. This entry was posted in Dear Mom, Food, Glorious Food and tagged Rum Ballls by ginny. Bookmark the permalink.